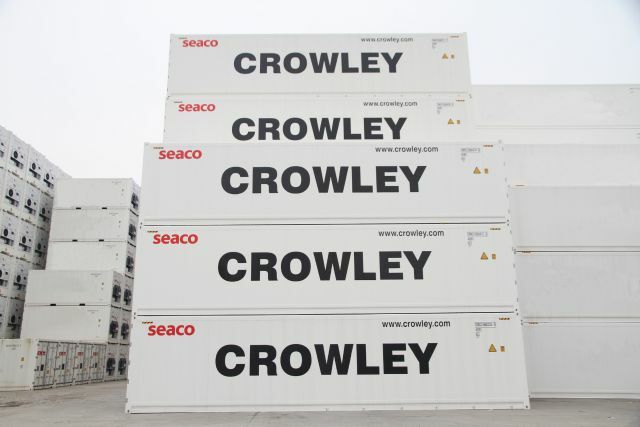 (JACKSONVILLE, Fla.; Dec. 7, 2015) – Crowley Maritime Corporation’s liner services group has added 400 new refrigerated (reefer) cargo containers to top off its industry-leading fleet of equipment to better serve the growing needs of its perishables customers in Central America and the Caribbean. All of the units are 40-foot high cubes, built to Crowley’s exacting structural and security standards. The 40-foot reefer containers are being delivered in Santo Tomas, Guatemala, directly from the manufacturing facility in a perfectly timed manner to accommodate the Central America’s heavy northbound reefer season, which is currently underway and will continue through May 2016. These reefers will also be deployed as needed throughout the rest of Crowley’s service lanes. The new containers are equipped with Carrier’s high efficiency PrimeLINE® refrigeration units, incorporating several changes to help boost efficiency and reliability even further. Since 2003, Crowley has invested over a quarter of a billion dollars in new cargo equipment for its liner services fleet. Today, the company operates more than 52,000 pieces of owned and leased intermodal equipment, including more than 22,015 chassis; 21,297 dry containers; and more than 3,916 refrigerated containers, all of which come in a variety of sizes and are strategically located throughout the United States, Central America and the Caribbean.